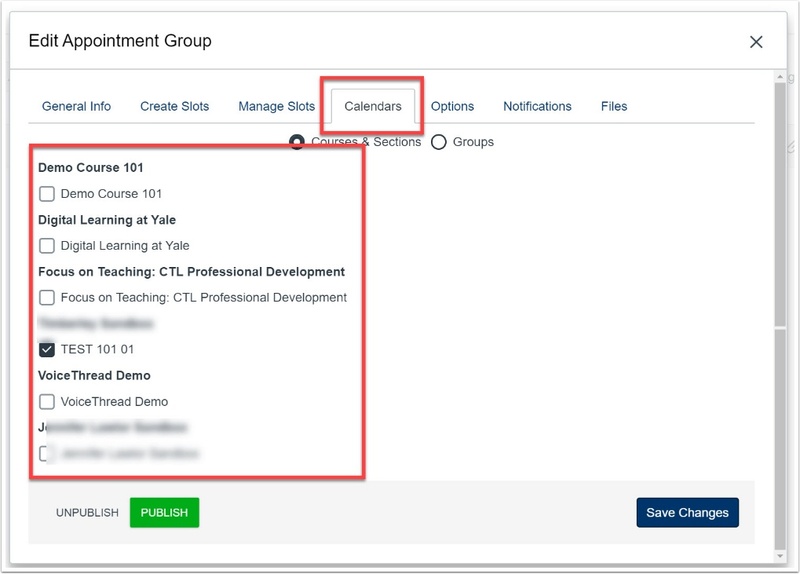 Canvas @ YaleInstructor Guides External Apps to use with Canvas @ YaleHow do I use the Sign-Up Tool? Please note: Sign-Up Tool is currently within a beta release. This means that there could be additional changes made based on the feedback received from those who are using the tool. If you are using the tool and would like to provide us with feedback, please fill out the following Google Form: Sign-Up Tool Beta Release Feedback. 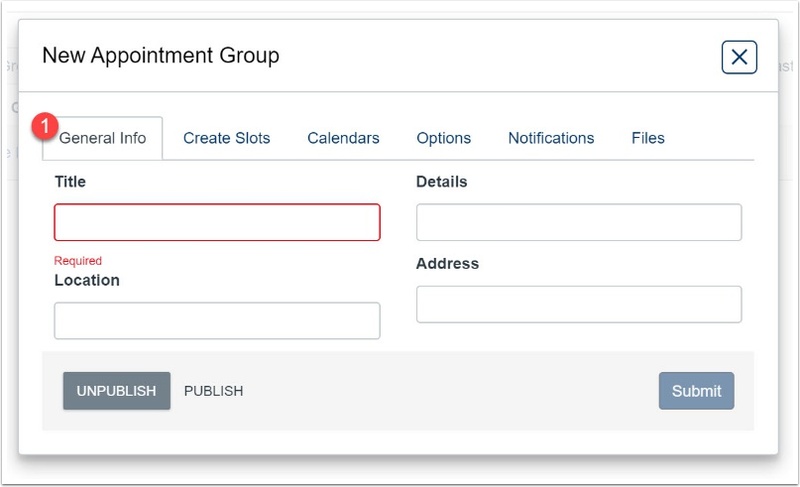 To make the slots available to students, make sure you publish your appointment block. Once it is published there will be a green check mark next to it. If you see an orange exclamation point next to a time slot you are trying to edit, it means that students have already signed up for that time slot. The only information which is required is title. However, you can also include the location, details, and address for the appointment blocks. 2. 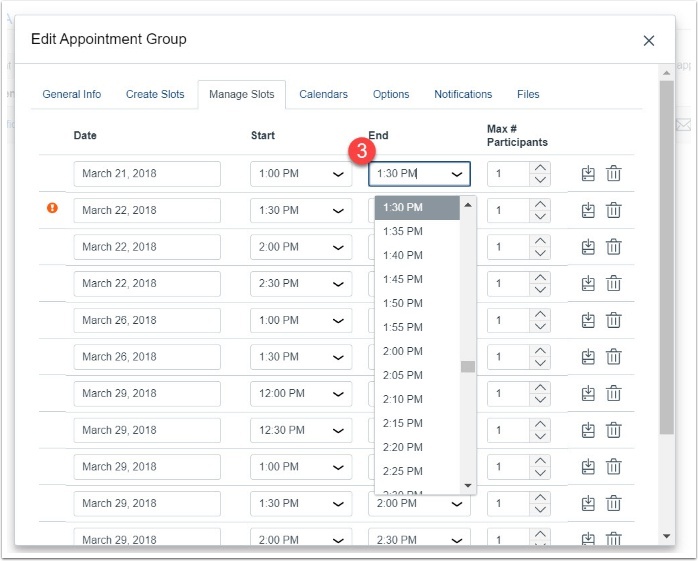 Choose the start date and the times of the appointments. Set the frequency (i.e. does not repeat, daily M-F, Weekly, Bi-Weekly, Monthly) and set the amount of occurrences. 3. Set the frequency (i.e. does not repeat, daily M-F, Weekly, Bi-Weekly, Monthly) and set the amount of occurrences. Set the duration, then select "Add Slots". *Note* You want to select the date that this will start. 4. Click on the "Manage Slots" tab. 5. Each slot is then created. You can modify each date, start time, and end time individually if needed. 6. If needed, you can delete a time slot. Under the Calendar Tab, if you are using this for multiple courses or groups, you can select every course applicable. 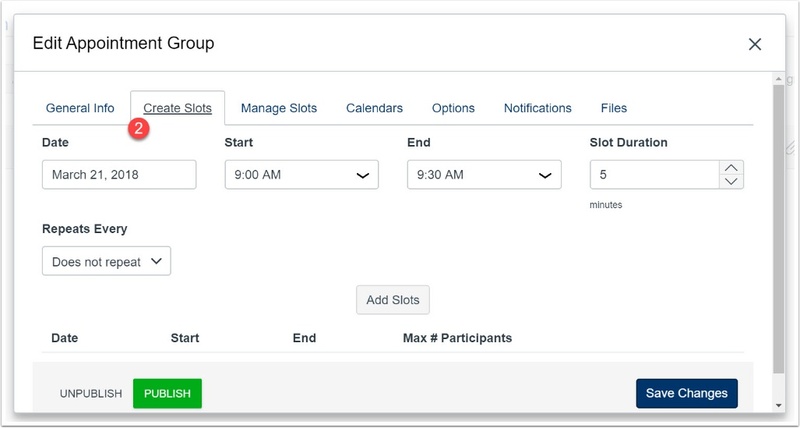 Under the "Option" tab, you can set the Max # of users per slot, max # of slots per users, and the user visibility. Note: If it is set to "visible", students will be able to see who have signed up for that time slot. Under the "Notifications" tab, you can modify the type of notifications that are sent out to the Instructors and TF's. Note: Currently the notifications are global for all instructors and teaching fellows. Meaning either everyone received notifications or no one receives notifications. 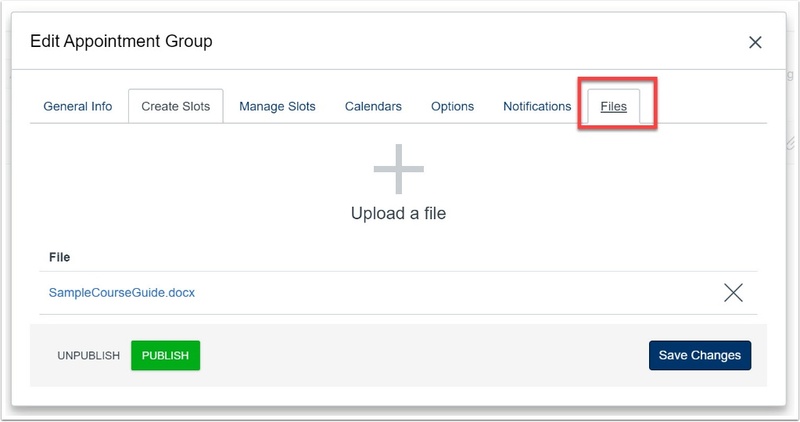 By Clicking the "Files" tab, you can upload a document which is applicable to this appointment group. 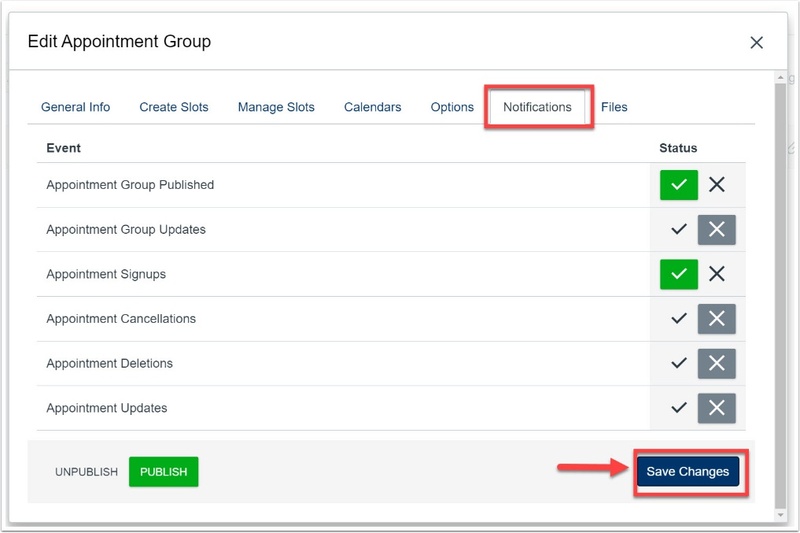 Once all of the information and settings are completed, click "Publish" to make it available to students and click "Save Changes"
From the Sign-Up too, click "Edit"
Zoom: click edit from the gear icon associated with the appointment block. 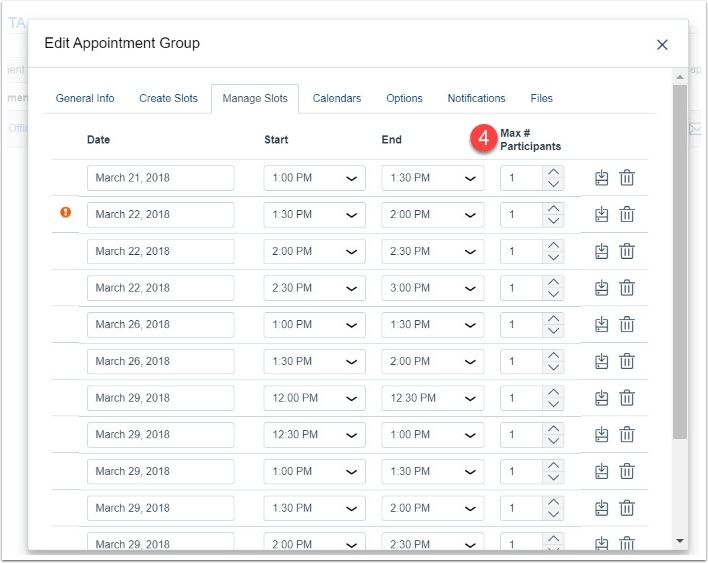 The appointment group information and tabs will appear. You will be able to edit all content by clicking on the tab associated with the information you would like to change. 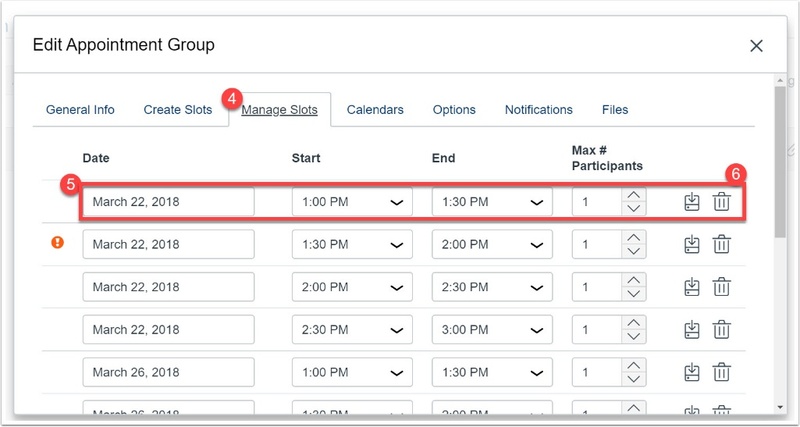 Once you are in the edit appointment group, you can click on an individual time slot and modify the criteria. 1. 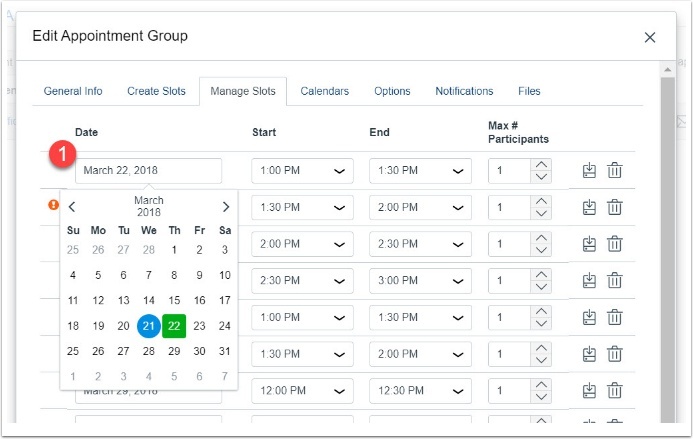 To change the date, you can click on the date, and a calendar will populate. 2. You can also change the start time and the end time (3). 4. Finally, you can modify the user limit for each individual time slot. 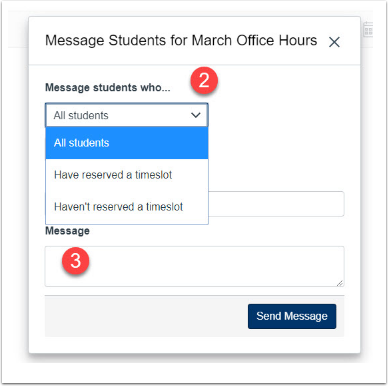 In order to reserve a time slot on the student's behalf, you need to open the appointment group to display the time slots and availability. 1. 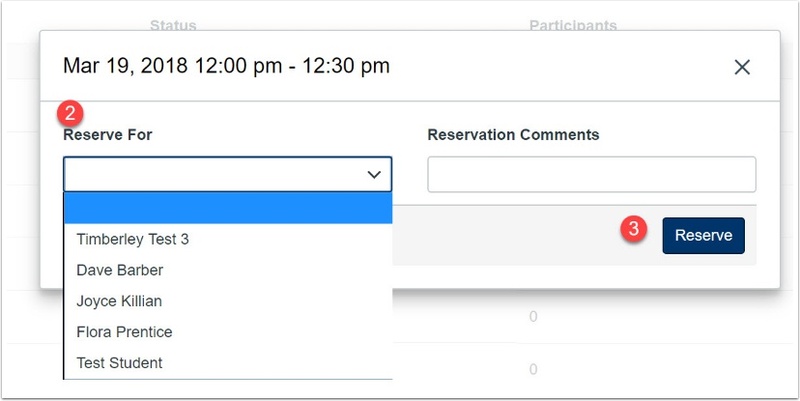 Click on the "manage reservations" for the time slot you would like to choose for the student. 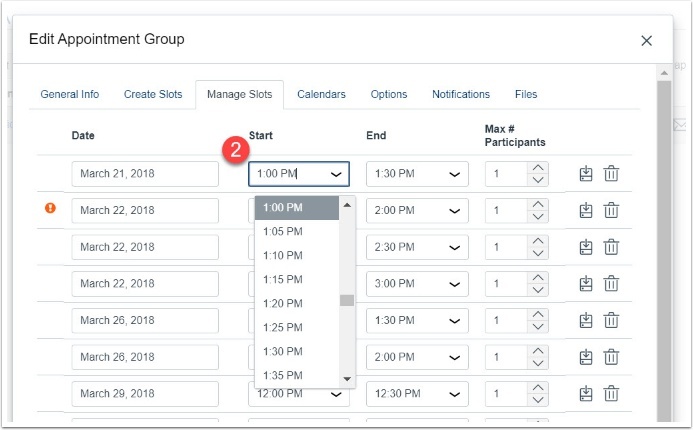 Zoom: Click on the time slot you would like to choose for the student. 2. Choose the student you are reserving the time slot for. 3. The student's name will appear associated with the "reserve for". 4. Click "Reserve" and now the selection will indicate that it is filled. 1. Click on "Participant Summary"
Zoom: Click on the time slot which has a reservation. 2. You will see the student's name listed under Participants for each time slot and date. 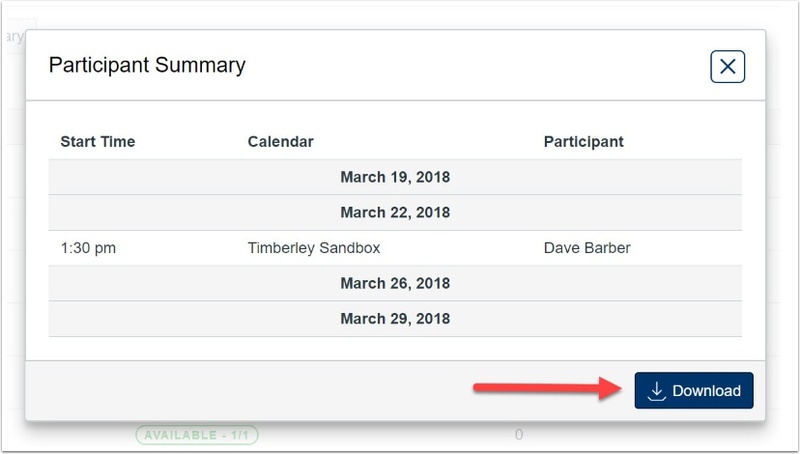 You can also download the participant summary as a csv. 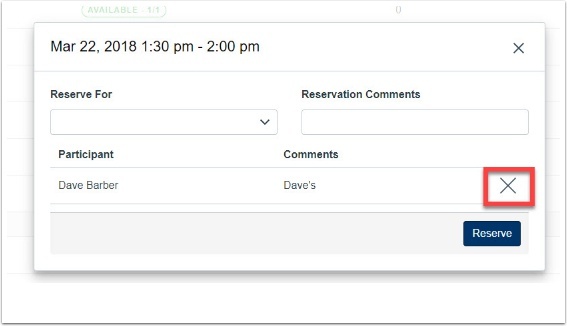 To unreserve an attendees' reservation, you want to click "manage reservations" for the time slot. Then you click on the X next to the attendees' name. A pop-up window will appear where you can write comments to the attendees on why you are unreserving their selection. Then click "Ok". 1. 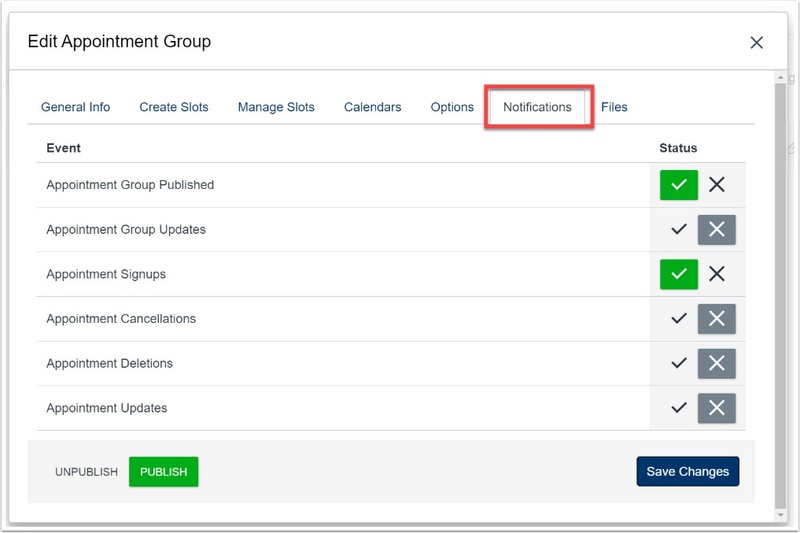 Click on the blue envelope associated with the appointment group. 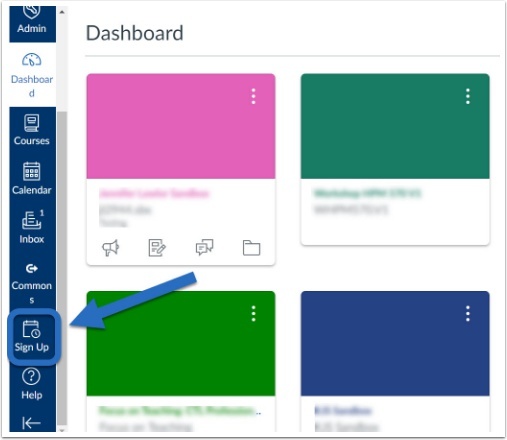 Zoom: Click on the blue envelope associated with the appointment group. 2. Select the category of students you would like to message. 3. Type your message, including subject, then hit send. The students will receive this via their Yale email address. 1. 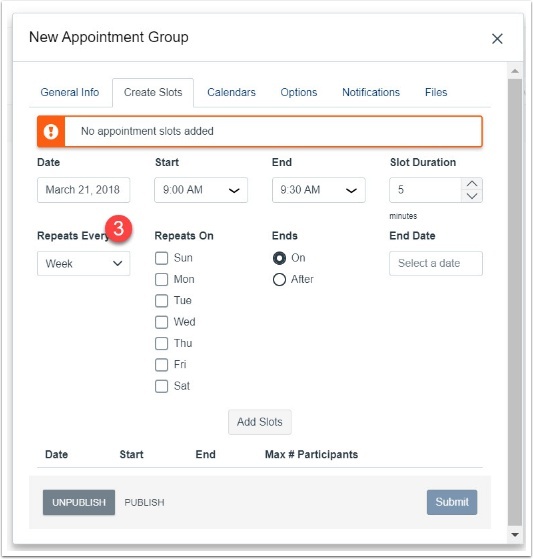 Click on the gear icon associated with the appointment group and select "Notifications"
Zoom: Click on the gear icon associated with the appointment group and select "Notifications"
Zoom: modify appointment block notifications and hit save.